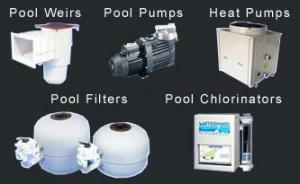 At i Quote Projects we're passionate about swimming pools. We've been building designer pools and doing quality installations of pool accessories like pumps, filters, heat pumps, solar panels and salt chlorinators for the past 6 years. We believe in doing things right the first time, which is the reason our guarantee is genuine. This is also the reason we install only good quality pool accessories manufactured by reputable manufacturers who offer decent guarantees themselves. Swimming pool renovations are an important part of our services as we enjoy reviving delapidated and neglected pools to their former glory............ or better! A large part of the renovation process usually involves a repair of some sort, wether it be a crack repair or building in a new weir. We need to perform these kinds of repairs to the highest standard to be able to perfectly renovate and revive your old pool.